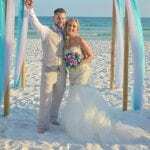 Kelly and Elijah enjoyed a beautiful Destin, Florida beach wedding ceremony in August. 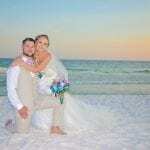 The love they shared was felt throughout their entire ceremony with unique touches, an abundance of smiles and an incredible sunset. 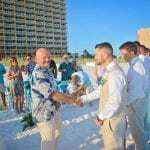 Kelly and Elijah’s Destin, Florida beach wedding ceremony took place right behind their hotel on the beach, making it easy for their guests and bridal party. 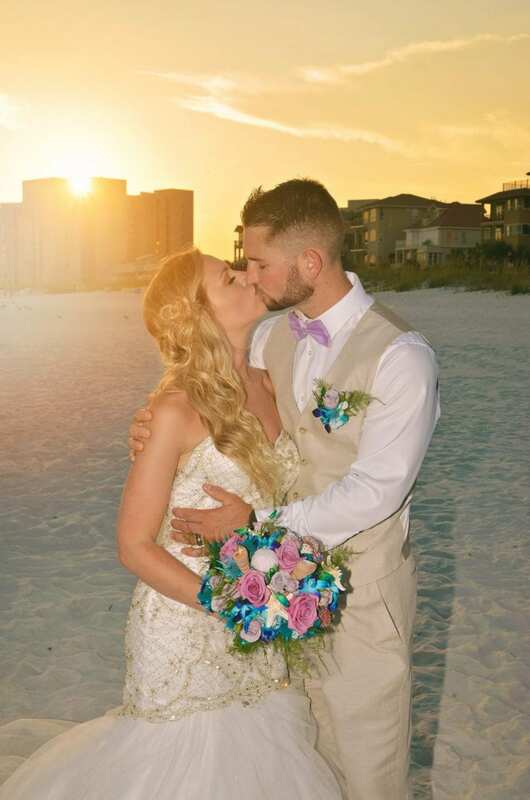 They added the additional photography time and ended up getting some beautiful sunset photos. 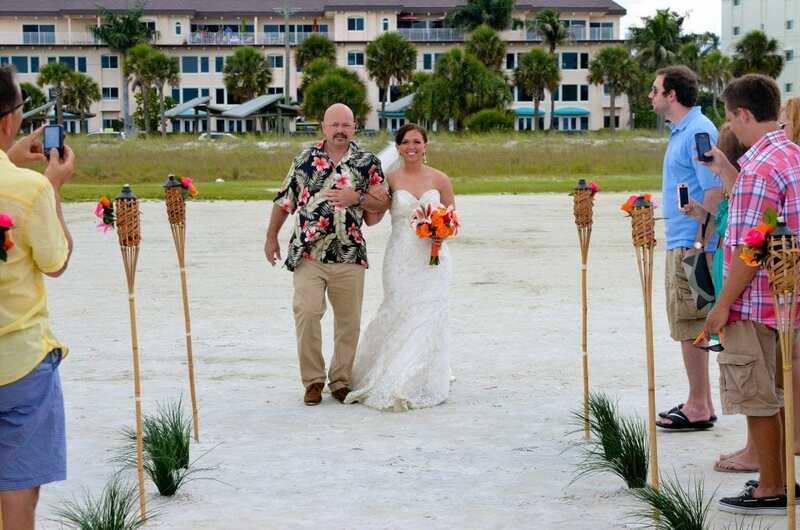 We couldn;t have asked for a more perfect day! 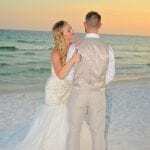 All of our weddings are special, but this wedding holds a special place as we married her sister just a few years ago in Siesta Key. 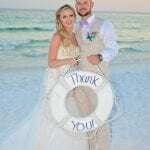 We are honored and thrilled that the family enjoyed our services so much that they decided to use us again for their Destin beach wedding. 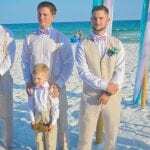 On the left you will see Miranda walking down the aisle with her dad and on the right Kelly being walked down the aisle by her dad. 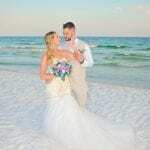 Kelly and Elijah celebrated their new life together with the teal Distinctive Design package. 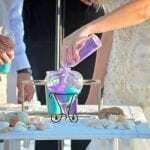 They made the package their own by adding a touch of lavender to the beach wedding canopy. 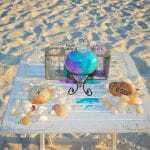 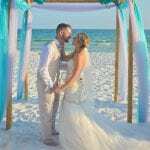 Our all-inclusive beach wedding packages include everything you need for your beach wedding to run smoothly; chairs, officiant, photographer, sand ceremony and more. 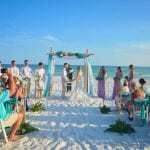 Our Teal distinctive design package includes a beautiful tiki torch aisle, teal flower arrangements and a large, elegant bamboo canopy topper. 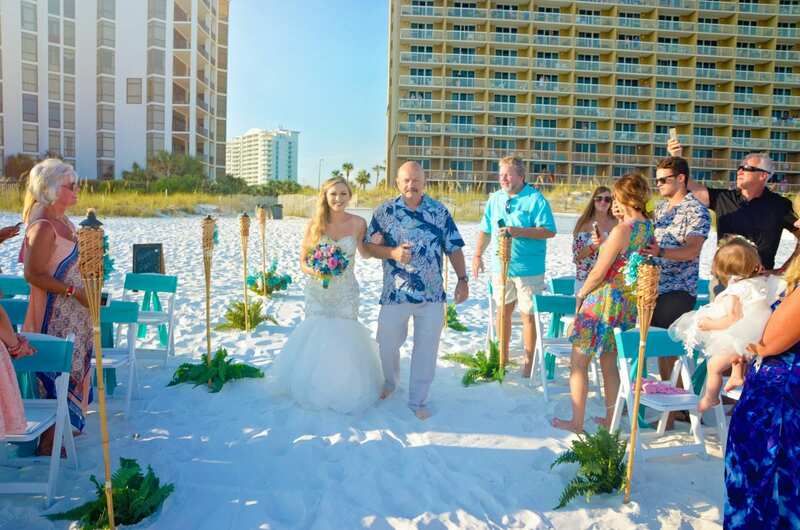 Our Distinctive Design package also includes a water and lemonade station for your guests to enjoy during your Destin, Florida beach wedding ceremony. 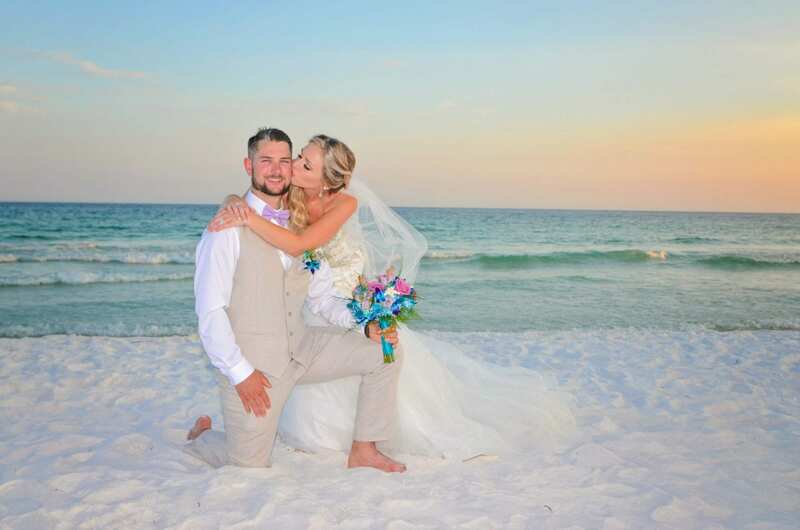 We absolutely love how excited Elijah was to officially be married to Kelly! 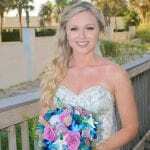 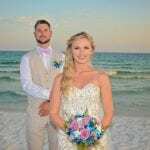 Just look at their gorgeous photos of their Destin beach wedding ceremony and scroll down to see their beautiful sunset photos! 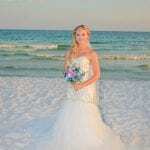 Our Destin, Florida beach weddings include photography in all of our packages. 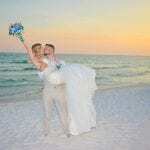 However, for the best experience possible we recommend adding the additional photography time. 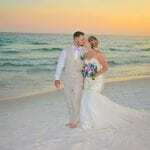 We absolutely love the photos that we got during Kelly and Elijah’s wedding, the sunset was breathtaking! 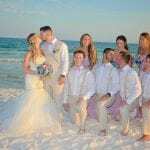 Destin, Florida beach weddings are beautiful in so many ways. 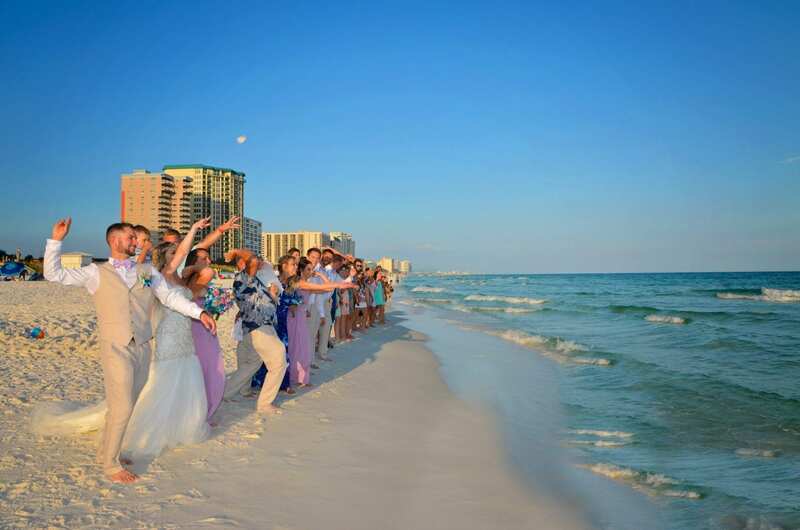 With the soft, white sand and emerald green waters of the Gulf of Mexico, you can’t go wrong. 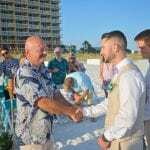 This Destin, Florida beach wedding ceremony was unique in so many ways. 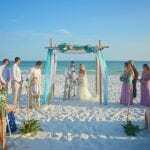 Kelly chose our Teal Distinctive Design beach wedding package and added a touch of lavender to the beach wedding canopy. 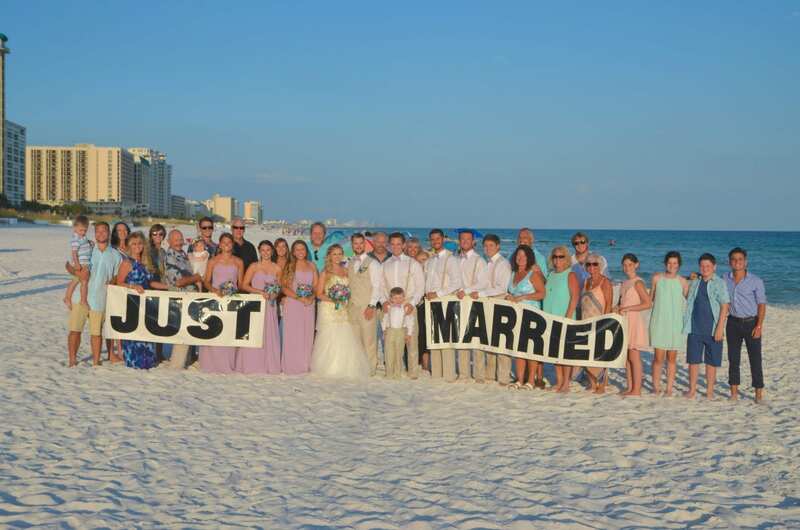 She also had a special section for her guests to “Take a shot and then take a seat” (note, this is not able to be done on most beaches). 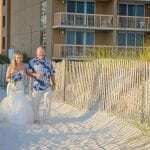 With all of our Destin, Florida beach weddings you can add your own special twists and touches. 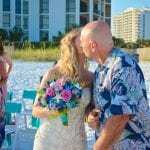 Check out our Florida beach wedding packages here.